With email tracking, you'll know exactly when someone opens your email. 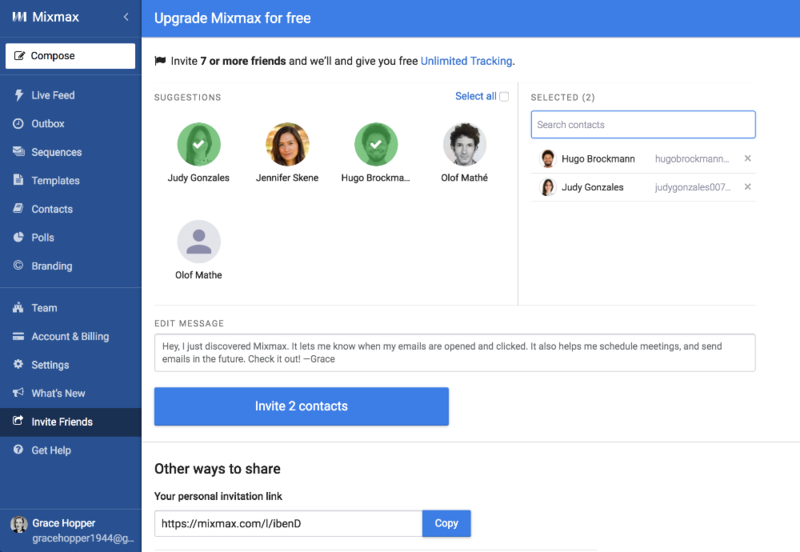 You can get unlimited open tracking for life by sharing Mixmax with 7 or more friends. The free plan gives you 100 tracked emails per month — sharing with friends means you'll have unlimited tracked emails, completely free! You can also share using your personal invitation link, on Twitter, or on Facebook! Interested in who opened when you sent an email to a group? Upgrade to the Starter plan! Interested in knowing when your recipient clicks a link or downloads a file from your email? You can get those insights on the Small Business plan. Compare tracking for all plans: see What kind of tracking is included in my plan?